Part of cousin's garden from first (second for US!) floor. What struck me was the different tones of green with the splash of mauve in the middle. 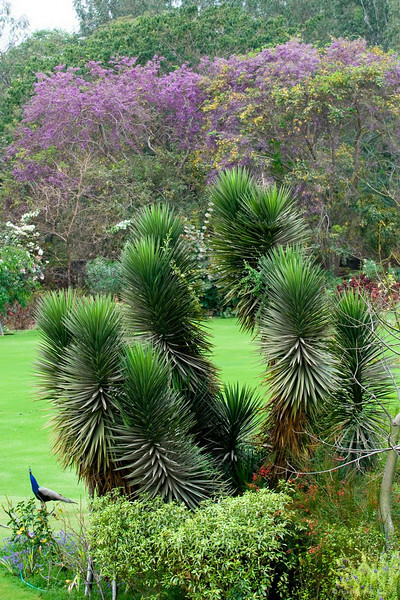 The spiky ones are Yucca and the mauve in the background are Mellitia Ovalifolia or Mellitia Blue. EDIT 12 July - The bird on the left is a peacock. Love the color and composition. Cool composition- really love the peacock there! Beautiful shot. And agree with you and Jeff about the tones of green. I agree with you. I really like the layers of green. Beautiful pic and a peacock too! What a lovely garden, I like the textures and colors in this shot.